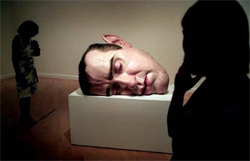 Ron Mueck, a hyperrealist sculptor, recently opened a new exhibition of his work at the Brooklyn Museum. For several years his shows have been accompanied by a 25 minute documentary that shows some of his work and his process. That documentary is now available online and worth checking out. After viewing it, if you are within traveling distance from his current show, you will likely be going. I’VE never heard that it is bad to ice your sore knees. If they hurt, than ice them. Of course stretching is key. You need rotate your kness clockwise, than counter clockwise b4 playing to get the full range of motion in them. This will help. But you should ice your kness for at least 10 minutes at a time. Don’t keep it too long or it will burn you. Yes, ice burns. Try putting heat on them b4 icing, and after icing. Trust me, your knees will thank you. Try taking motrin also. it is an anti inflamatory.